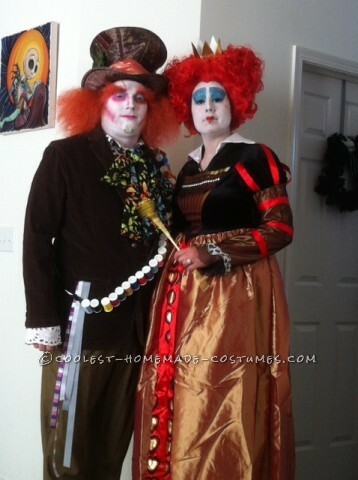 We bought the red queen costume. But made his mad hatter costume from scratch except for his hat. We bought everything at goodwill and i hot glued thread spools to 2 belts that he wore across himself. short pants. 2 different socks. a plaid vest butterfly scarf and brown corduroy jacket. Then i took some ribbon and hung it out of the pocket. I did both of our makeup. My husband has a small beard so i gluesticked it down and covered it in white paint. His makeup was copied from the movie. Mine was as well. I used glue stick to smooth down my eyebrows and then covered them with white makeup so my eyebrows could be higher as well. I think his whole costume minus the hat cost us 11 dollars. The wig for mine was amazing. It was just from the movie. The best part was that we drove like this .